Over its' over-90 year history West Herts has accumulated a rich array of trophies with which to reward the hard work of its members, some of which are bequests from members sadly departed. These are presented at the annual dinner at the end of the season and are always eagerly anticipated. Chris Goodban was the first person to be awarded the trophy and, sadly we lost Chris at the end of 2013 after a long battle against cancer. Chris was a long serving member of the Club acting as captain several times during a long career; the 2nd XI between 1969 and 1972 and then a lengthy stint with the 4thXI from 1983-80 and the 5th XI in 1980-81. 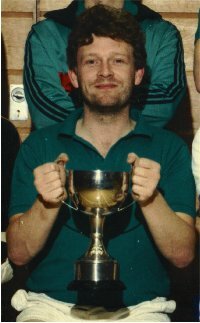 As such he is remembered fondly by many current players as their first captain at the Club- and his authority and coaching stood many a younger player in good stead for their budding hockey careers. In the "Good Old Days" at Park Avenue, when such things as jugs of beer were still a popular and regular post match feature, Chris was a confirmed "Youngs Man" and your author remembers incurring his wrath (a quietly spoken, gentle wrath) for using the kitty money to buy Brakspears, we never did agree on that issue! Chris always had the Club's interests at heart and held forthright views on many aspects of its' running. He was a champion of the formation of the ladies section, flying in the face of several sceptical "old lags" in the clubhouse. Geoff was a longstanding member of the club and even took a stint as groundsman during the '70s. The shield he gave to the club resided unnoticed in the bar for several years before it was decided to make it into an award for the member doing the most to integrate juniors into the adult club as a whole. Bill Marsden, or "Chuffer" as he was known at the club was a long-time "club" umpire...the kind of really valuable person who has no desire for stardom (umpiring stardom didn't exist in the 60's and 70's, not like now), and merely wanted to come along on a Saturday, blow a whistle to stop 22 men with sticks from harming each other and then settle down in the bar to quaff ale and smoke fags...Bill was a prodigious smoker but despite that he lived well into is 90's and ended his days at the Abbeyfield home right opposite the Club in Park Avenue. In his day job Bill worked for the Midland and later London, Midland & Scottish Railways, a job of which he was immensely proud. He would have been one of the very first people in the country to have been aware of D-Day as he was responsible for train movements across the midlands and was told of the huge number of troop train movements just before the invasion set off...he was so excited he couldn't sleep...much to his wife's disgust. Before he passed away he expressed a wish that an award be made each year to the person who had done most to ensure that the "lower end" of the Club got umpired properly, and in its' first year it was awarded to Colin Warne. Donated by Luke Lucas, the inaugural captain of the club's 5th XI upon his retirement from the club. It is awarded to the most improved young male player (although a committee brainwave gave it to a girl once). It is not necessarily aimed at a superstar of the 1st team, more seen as a reward for improvement by a lower XI player. The "girls equivalent" of the Lucas trophy was donated by Chris Cadman, a vice president, to reward the best young female player in the season. Chris enjoyed a long playing career with Stags and will be fondly remembered for his colourful dress sense and ever-present titfer when umpiring. A bequest from Geoff's family was dedicated to the best performing team of the year, Geoff championed the cause of the club's 6th XI for many years, ensuring its survival in the face of advancing league hockey by a determined hounding of the less than 100% committed and the football fans among the club membership. The word "boundless" was probably invented just to describe Geoff's enthusiasm for the game and its' promotion amongst the younger generation. Maurice Forsythe came to the club from Ulster in 1989 and immediately galvanised the club both on and off the field. The bar became an altogether livelier place (if that were possible), and his energy galvanised a new generation of members to go onto the committee and to move the club on. During his time he captained the 1st XI. When he died at the tragically early age of 45 his mother Edie raised the idea of inaugurating a trophy in her son's memory. We decided that as at his former Ulster club, East Antrim we should create a cup for the highest goals scorer in the mens club during the league season - after all Mo liked nothing better then the thump of ball against backboard. Hopefully it will focus player's minds on the fact that the game is all about enjoyment, both on and off the field. "Mojo" in his younger days as a rising star of the Ulster junior system. Awarded each year to the highest score in the ladies section, and since its' inception it has been the sole property of 4th team skipper Rachel Aldridge, who in 2013-14 netted over 40 goals. Awarded to the best defender or goalkeeper from the team with the best defensive record. Not necessarily awarded every year but the winner could be a team, an individual or a group of people who have made an exceptional contribution to the development of West Herts Hockey Club and have not been recognised in another way, perhaps because they do not quite fit the criteria for other awards for some reason. For a fuller rundown of the winners please refer to the HONOURS BOARD page.